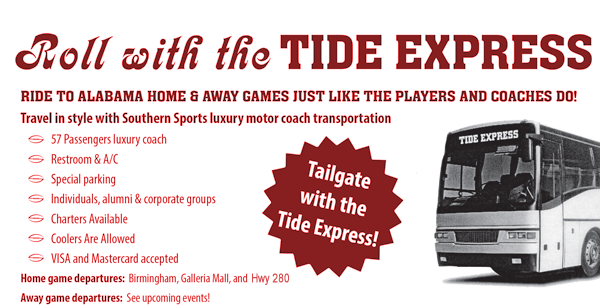 Southern Sports has your ticket to ride to Alabama football games on the TIDE EXPRESS/TIDE FOOTBALL SHUTTLE. 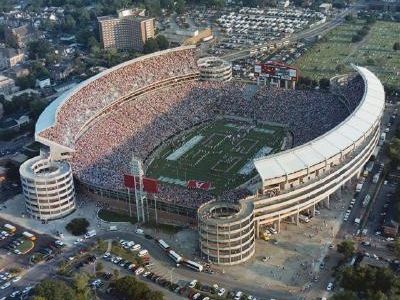 Southern Sports operates the TIDE EXPRESS Birmingham Shuttle to Alabama home games and select away games on 57 passenger luxury motorcoaches. Home games departures are from the Birmingham Sheraton, Galleria Mall, Bessemer and Tuscaloosa. Away games departures are from Birmingham and other cities. Advance reservations are required. All fans are welcome! The Tide Express LSU Special runs every other year for the ALABAMA vs. LSU game from New Orleans to Baton Rouge. The Tide Express Special runs from Birmingham for Auburn away, from Birmingham and Montgomery. Hotel reservations and tickets available on request. Coolers are allowed. Southern Sports has your ticket to ride for Talladega race transportation on Talladega race shuttle. Southern Sports has provided transportation for over 15 years for Talladega race fans. The Talladega race shuttle runs from Birmingham area hotels for Saturday and Sunday races for the Spring and Fall races. Transportation provided on 57 passenger luxury motorcoaches. Individuals, Groups and Corporate can be accommodated by our professional staff. Reservations are required and accepted year round with Visa and Mastercard. All fans and all the countries are welcome. Southern Sports offers packages for group leisure travel. Southern Sports knows the Gulf coast area and the Southeast. Gulf coast beach packages available for Hotel, Golf, Deep Sea fishing, and recreational activities. Southern Sports can handle the details for your group or corporate outing for a professional sports event in Atlanta, Nashville, or New Orleans. Transportation, Hotels and Tickets are available upon request. Southern Sports can arrange your next golf outing in Alabama, and the Southeast. Event planning is available upon request for sports events and corporate meetings.